Welcome to the Whole School Learning Project! 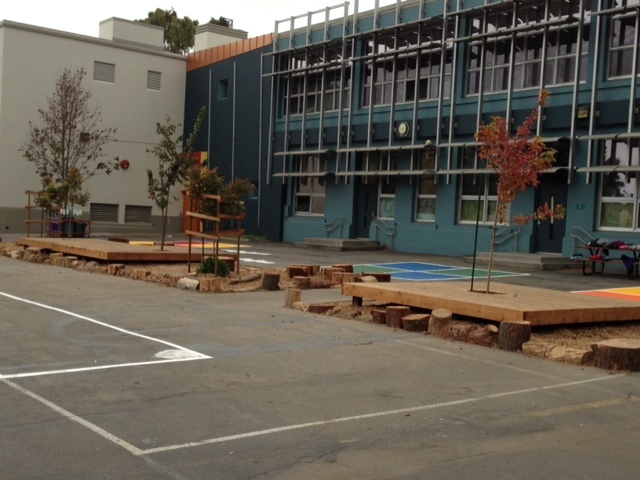 We at Washington Elementary School in Berkeley, CA–working with Bay Tree Design– have developed a visionary plan to transform our schoolyard into a learning, discovery–and play environment, as well as to build community through the ongoing contributions and collaboration of Washington parents, teachers, students and neighbors. View plan. Check out these great photos of our students enjoying the new Zone–this might be more accurately called the Play Zone! 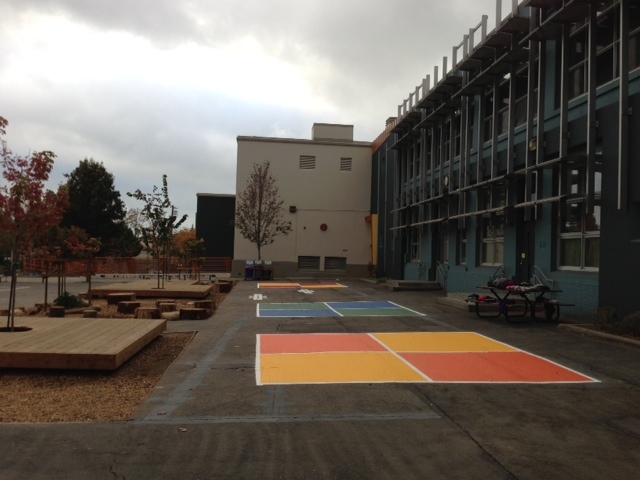 Beautiful Quiet Zone Additions–Thank you Berkeley Project! Check out the trees and seating areas by the main building when you get a chance! 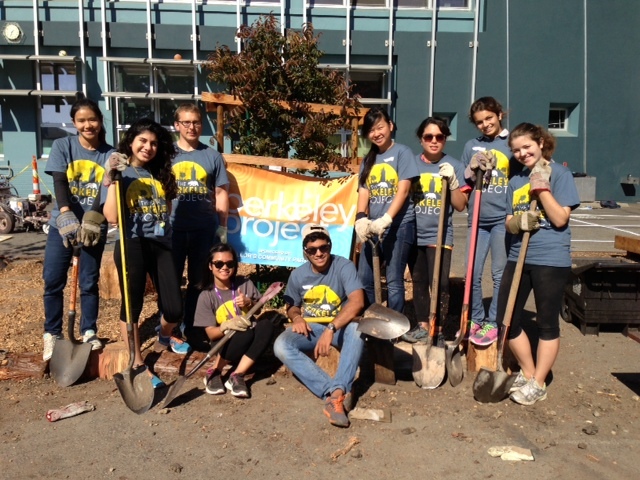 The Cal students from The Berkeley Project labored all day Saturday (10/27/13) to make the space even more beautiful and useable for our children (not to mention containing the woodchips)! It looks fantastic and we could not have done it without them. Also a hearty thank you to my fellow mom Keira, and to Julian, Steve and George, the dads who made 1 or 2 trips each to the log yard to haul in the 40 plus logs that we dug in. 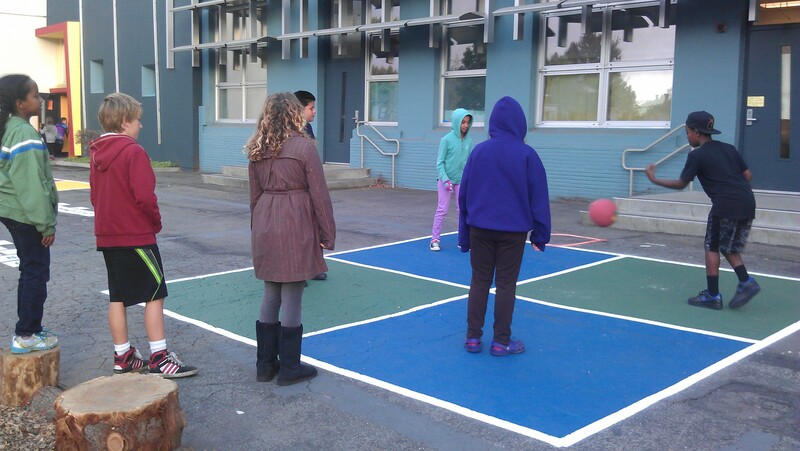 In addition, BUSD began striping the yard–we have 2 NEW four-square games and 2 NEW hopskotch games in the Tree Zone. Plus our basketball lines have been newly painted and they got started coloring them in, along with a refresh of the Compass Rose. It looks terrific! First came the trees, then came the seating areas. Thanks to an excellent crew of parent volunteers, our beautiful redwood seating areas are now complete and ready for use. This project was completed in collaboration with BUSD, teachers, students and the Washington PTA. For MORE photos of the new additions to the space, and an update to the project, click here. We also have a lovely paved path to help with traffic across the woodchips. A special thank you to Annie’s Homegrown for a grant to support this project. A beautiful video put together by Washington parent Cesar Chavez thanks our principal, Rita Kimball. Update: Trees Have Come to Washington! 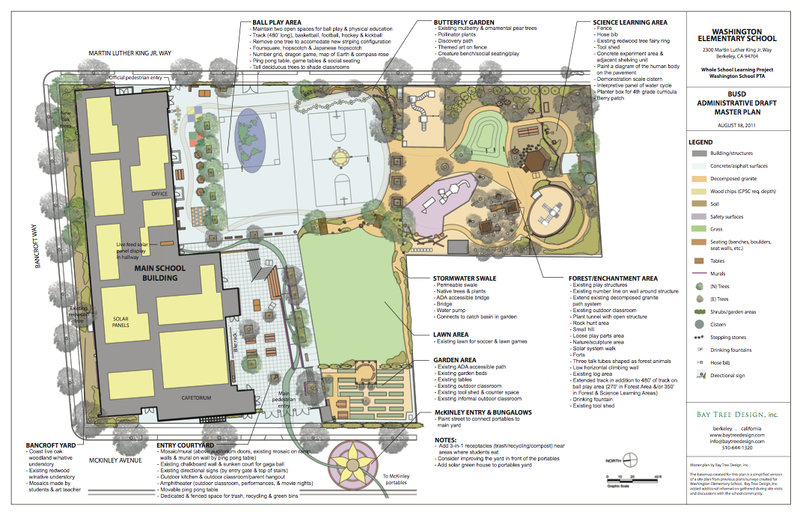 We at Washington–working with Bay Tree Design– have developed a visionary plan to transform our schoolyard into a learning, discovery–and play environment, as well as to build community through the ongoing contributions and collaboration of Washington parents, teachers, students and neighbors. It’s called the Whole School Learning Project. You’ve seen the results in the mosaics, signage, chalkboard paint and colorful entryway to the school. To help us achieve our vision, we’ve raised money from our supportive PTA, Annie’s Homegrown (natural and organic mac & cheese, snacks, and dressings); Whole Foods Market in Berkeley and Patelco Bank in Berkeley. This “Quiet Zone” is the shorthand name for the line of trees we will plant on the north side of the blacktop near the main building. These trees (all hearty, shade-giving, and fast-growing) will enable shade on the building, and ultimately the upper level classrooms as well, which get very hot in the sun. It will also enable shade on the blacktop and a bit of separation between hockey and other team games, and create a nice entryway from the MLK gate. This “zone” will also have benches around the trees for sitting, playing and resting, along with more painted games on the blacktop. Why did our plan include a change to the layout of the blacktop? Some kids like sports, some kids just want a place to sit and watch or talk. The Washington yard is a mixed use space and the role of the Quiet Zone is to accomodate multiple yard uses. It balances out the space to match up the variety of ways kids like to use it while still keeping a very large blacktop area. It will also make for a nicer entrance from the MLK side and shade in the heat of the late spring through early fall. Here are the next steps in finishing the Quiet Zone so that it can meet everyone’s needs. -The irrigation lines have been laid by a Washington parent, and the trench has been filled in. -The decks/benches are being drawn for details and as soon as we have a final drawing they will be built. As soon as the decks go in, the barriers can be removed and the tree area will open up for use. Timing: estimated by end of June. This plan was developed over 3 years with the help of the Washington community–teachers, students and parents all participated in its conception. BUSD adopted it as the master plan in 2012. 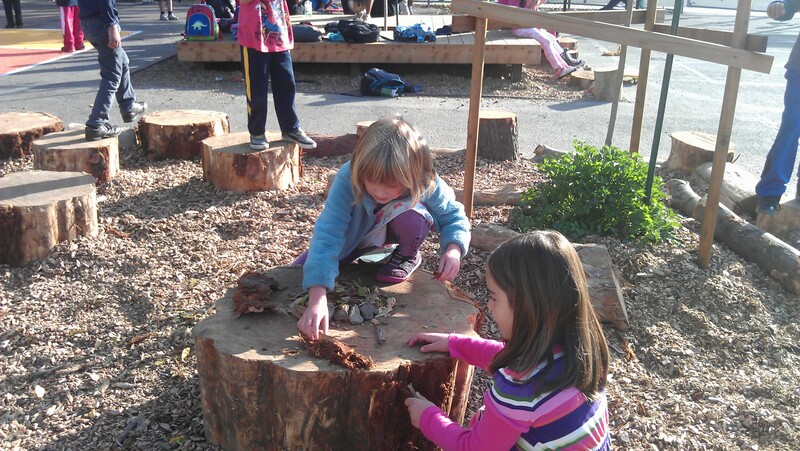 The mission is to transform our schoolyard into a learning, discovery–and play environment for all students. 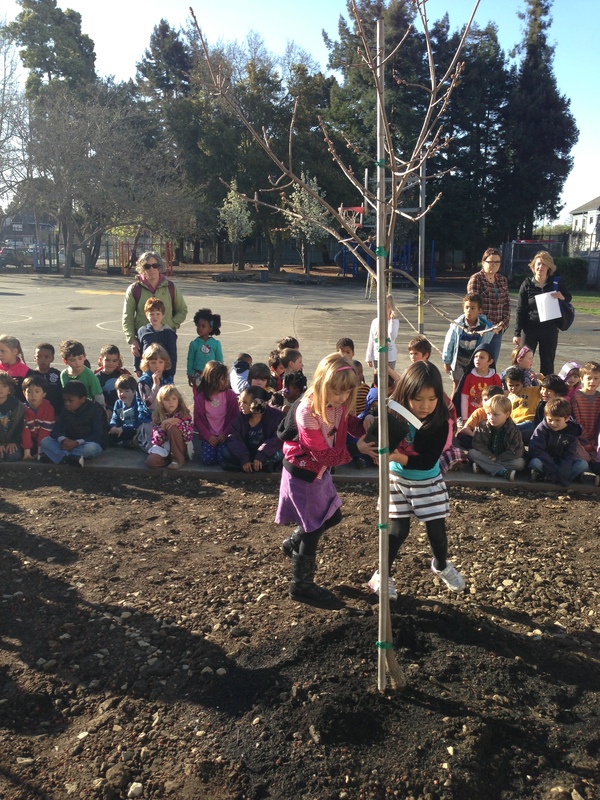 Thank you to BUSD for digging the tree area and planting the trees as well as laying the trench for irrigation! We will solicit community help (eg YOU!) 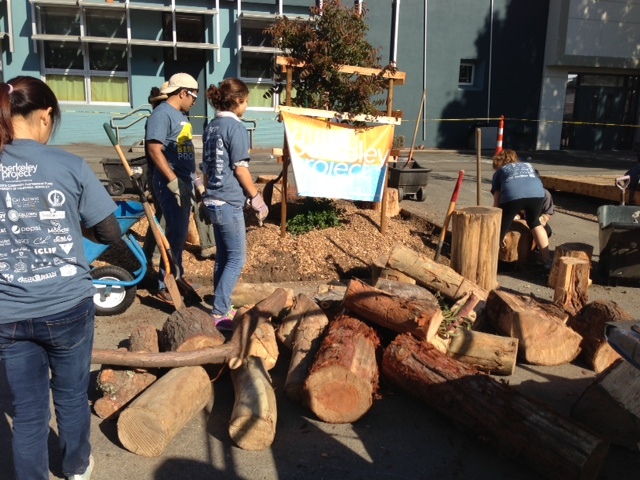 for bench building around the trees, game painting on blacktop, and planting of the understory. Great news on the Whole School Learning project (aka “the outdoor transformation). A little background: The Washington community has done a tremendous job of implementing wonderful things from the plan (mosaics, chalk paint, signage, compass rose, garden signs, outdoor classroom) while we awaited the district’s adaptation of the whole school learning project plan as the “official master plan.” Now that it is official we can move forward with a larger project. This “quiet zone” is the shorthand name for the line of trees we will plant on the south side of the building, on the blacktop. These trees will enable shade on the building, and ultimately the upper level classrooms as well, which get very hot in the sun. It will also enable shade on the blacktop and a bit of separation between hockey and other team games, and the entry on MLK. This “zone” will have benches around the trees, along with painted games on the blacktop. This part of the plan also includes removing one set of basketball hoops and restriping the blacktop. The design allows for Coach Don to continue to have multiple games going on at once, as well as a space for more quiet play. The hoops will be replaced by a set of portable hoops that can be raised and lowered depending on the age/height of the kids playing. Right now these hoops are quite tall for the littler ones. The 2nd set of hoops will stay right where they are. How we’ll make it happen: So here’s the great news. In order to determine how to proceed with the help of BUSD, we met with Steve Collins from BUSD Facilities a week or so ago, about moving forward with the “Quiet Zone.” Steve stated that we will get assistance from BUSD for the “big stuff”–mainly asphalt digging, trenching for irrigation and restriping. We will solicit community help (eg YOU!) for irrigation plan, irrigation material and installation, bench building around the trees, game painting on blacktop, and other items tbd. We have a small budget from the PTA funds that will go partially toward retaining Bay Tree Design (who has stuck with us on this for 3 years! 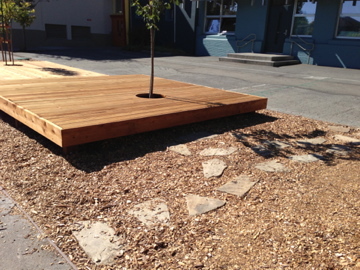 ), and partially toward materials like trees, irrigation and bench materials. The PTA budget will cover some but not all of the costs, so we will need to get creative, get volunteers, and probably raise a bit more money. 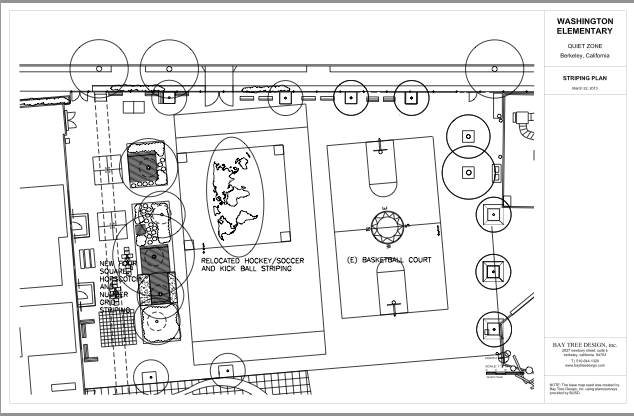 Next steps: The ‘schematic’ (more detailed site) drawing will be developed by Bay Tree Design, and there will be a meeting for community review to ensure the design meets the committee members’ expectations and BUSD requirements. As soon as that is ready to review, I will set up a community meeting. We have great news. You know that big map of the Whole School Learning Project that is posted outside the school office? Yes, the plan that reflects two years of a highly participatory process with our teachers, students and parents to enrich our outdoor space? Well…on Feb 22, 2012 it was unanimously approved by the Berkeley Unified School District School Board. That means that we can initiate projects knowing that conceptually, they are approved. We simply need to identify what to move forward with, what to fund and what to fundraise for. 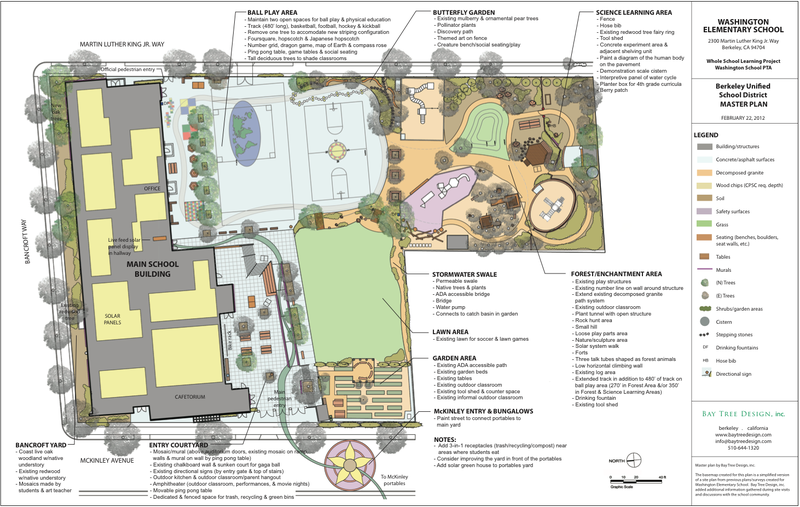 This plan will be a wonderful way to continue to build on the strengths of Washington Elementary. The plan enriches the whole campus with additional recreational, educational and ecological features that will make it an even more exciting, beautiful, interesting and comfortable environment for students and adults. It is also designed to be implemented as time and resources allow, making for a manageable, sustainable approach for an ever-changing community. Examples of what the plan has already inspired: Logs for seating in our outdoor classroom and for playing and seating in our yard. Boulders around our stage outside. Chalkboard painted walls. Mosaics. Sign posts. A colorful school entrance. And more. And these are just the small things. Now, we need to review the plan and prioritize the next set of projects this community would like to fundraise for and move forward with. Some are big projects, some small. All are rewarding. 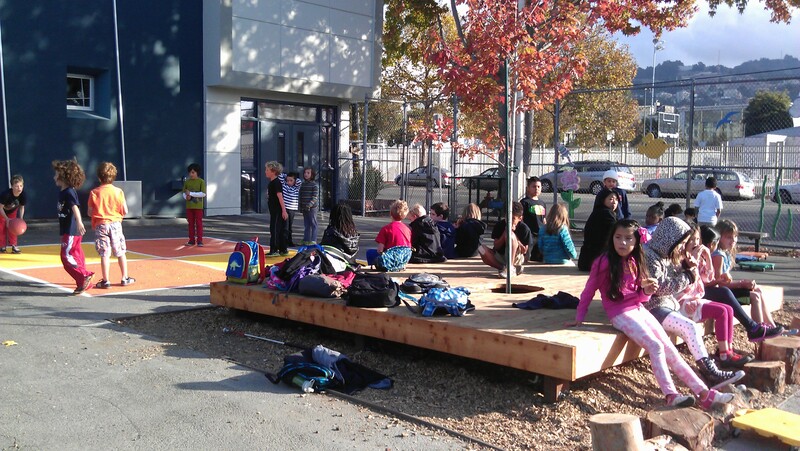 Update: The community and Principal Kimball determined that the “Quiet Zone”–the tree line to the south of the building on the blacktop would be our next big project in the 2012/13 school year. The Washington School PTA is a 501(c)(3) non-profit organization. All donations are tax deductible.